The handy guy, or Stefan, as he’s otherwise known, has a penchant for chillies. While last summer he kept referring to the chillies I’d planted and nurtured as ‘our chillies’, invariably followed by a ‘hmm hmm’ from me, this year they really are his chillies. Below he describes from whence came his passion for the chilli, and his secrets to chilli-growing success. I wanted to start with the moment that began my love of chillies. But, apparently for me, eating chillies wipes out memories of moments past. They ain’t no sweet cakes that’s for sure. Firstly, a brief lowdown on the chilli. The myriad varieties of chillies derive from five species of the cultivated Capsicum: C. anuum, C. baccatum, C. chinense, C. frutescens and C. pubens. These yield everything from the sublime bell or sweet pepper to the ridiculously hot Trinidad Moruga Scorpion. The heat of chillies is measured using the Scoville Scale. All have a different flavour and intensity of heat depending on the region where they were cultivated. Eaten by Americans since 7500 BC, it wasn’t until the Americas were ‘discovered’ by Columbus that chilli peppers were introduced into Spain and Portugal. The Portuguese then traded the chilli with Asians and Arabs, who hungrily made it part of their culinary traditions. When I first met Sophie she was growing and bottling Jalapenos. These were unbelievable [Editor’s note – Russell’s Jalapenos in Brine are equally excellent]. They were firm, juicy, flavourful and hot, like Sophie. I couldn’t eat enough. Fast forward to now and she’s ‘encouraging’ me to grow all the chillies. I am not a natural gardener but having Sophie on site has given me the confidence to stick small green chilli plants into dirt and mother them. Originally I bought Scotch Bonnet and Habanero chilli seeds from an online seed library, hoping to propagate them, but the combination of strong winds and a flimsy plastic greenhouse put paid to that. Undeterred I paid a visit to CERES Nursery and stocked up with Thai (Asian), Firecracker (Indian), Jalapeno (Mexican). Still unsatisfied with our supply we took a trip to The Diggers Club in Heronswood, where I bought a Black Pearl (Mexico), Bhut Jolokia (India) and Habanero (Mexico), and the classic Cayenne (French Guiana). I was also given a choice piece of advice. Once the season is over, prune the plant back to almost a single stem – the plant will re-shoot the following season with vigour. 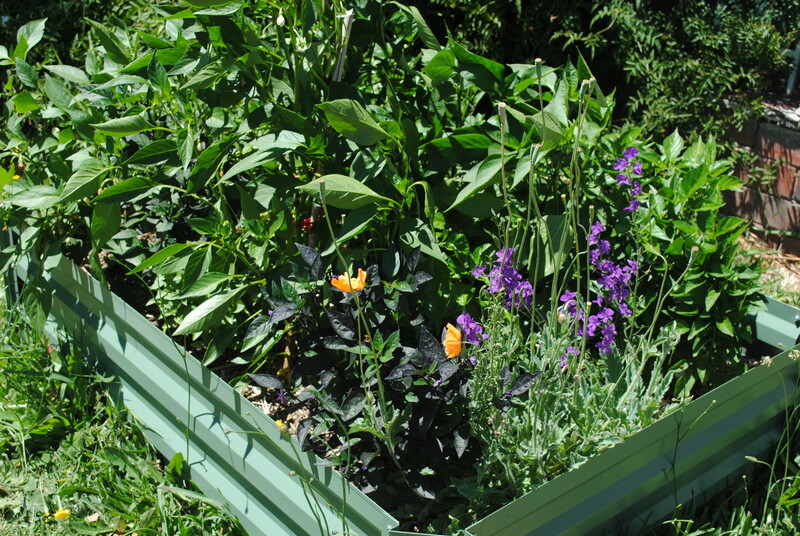 Now, to growing them … I chose the sunniest position in the front garden and set up a $40 Aldi metal planting box, on the bottom of which we laid hessian sacking to kill off the grass. 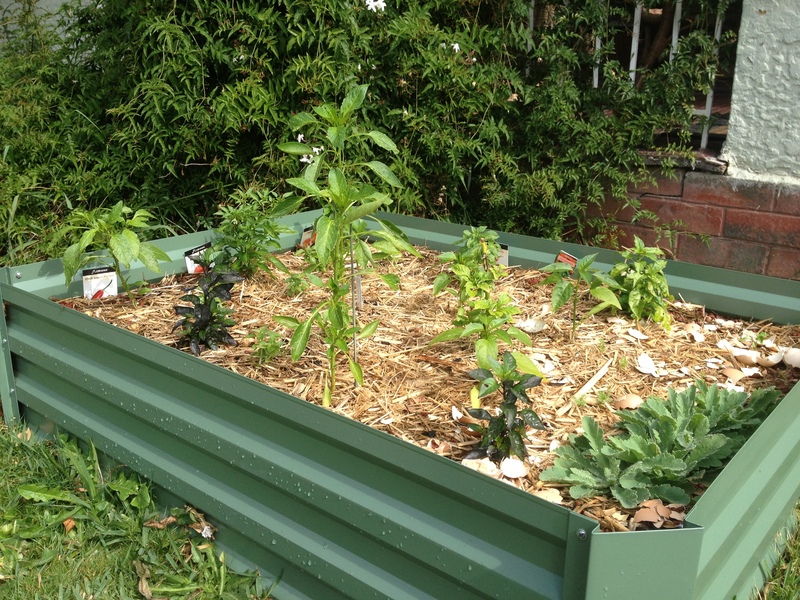 We filled it with four loads of compost, three bags of cow manure and topped it all off with sugar cane mulch. I’ve been keeping the soil moist but not too wet. 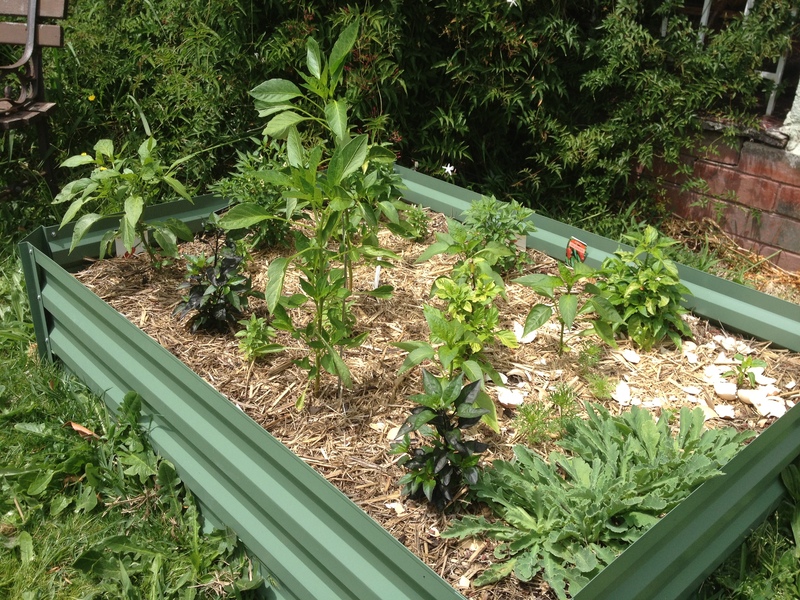 The mulch helps to retain moisture and with one watering of a 1:10 mix of homemade chook poo ‘soup’ at around five weeks, the charge was set. What could possibly go wrong? That’s right – nothing. A powerhouse of sunlight and nutrients is driving a steamy array of chillies into a salsa of flowering and fruiting. The first week. Eggshells were unsuccessful in deterring marauding snails so I turned to eco-friendly snail defender. The plants to the left are poppies and larkspur. At nine weeks. The poppies and larkspur add a touch of early colour. The first of the Black Pearl fruit. The leaves are dark green and turn purple in the sun. The fruit ripens to red and is medium hot. I planted out in the last week of October and eight weeks later I have my first ripe fruit from the aptly named Firecracker (see feature image). 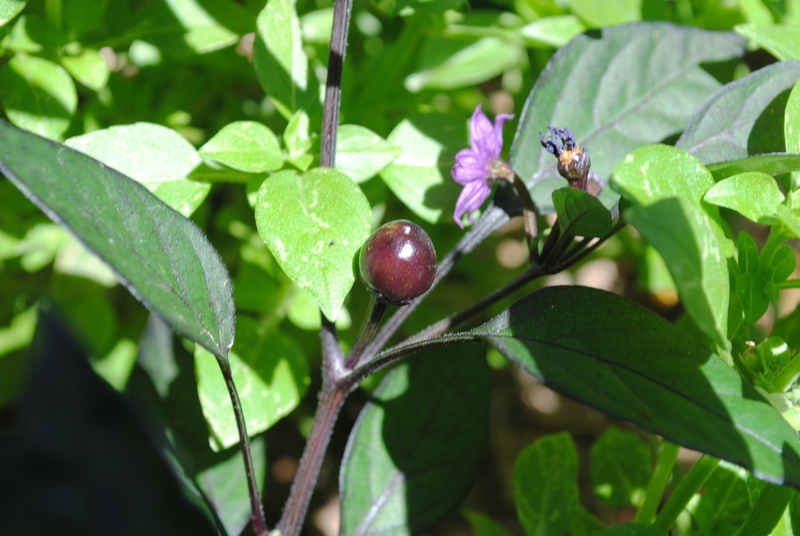 The Black Pearl is showing a number of the unripe fruit from which it derived its name. These will ripen to red in time. The Cayenne is not missing a beat and firing up in the heat. The Bhut Jolokia was planted so I could experience what is alleged to be the second hottest chilli in the world. I doubt it will be useful to cook with but the other beauties will – fresh, dried, pickled, sauced and pasted. I’ll write another post on recipes when I’m inundated by the shiny little, reflux-inducing fruit. Often The Buzz’s sign off is to link a song with the title of the post. I won’t waste your time with Glenn Frey’s 1980s abomination. No, that’s not the way I roll. So I found Chilli Fried by Deep Street Soul. Infinitely better and it has chilli in the title. So, groove on this.